At Cash City, our foreign currency exchange rates always beat the banks. When you need to convert your cash from Canadian to foreign, or vice versa, Cash City will do it for you quickly, and at the most competitive rates based on the daily market prices. Regardless of the amount of money you need exchanged, Cash City always has a ready supply of US dollars, Euros, and British Pounds on the spot, and can order just about any other type of foreign currency to be picked up as soon as the next business day. To provide comfort and security to our customers, all currency exchange transactions are fully compliant with FINTRAC regulations. With our convenient, centrally-located Etobicoke spot, along with extended operating hours, fast and secure service, you’ll be glad you stepped into Cash City. Why exchange money at Cash City? 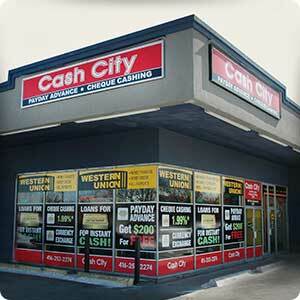 Get your currency exchanged – visit Cash City in Etobicoke today. Which types of foreign currencies does CashCity exchange? We have a ready supply of US/American dollars, Euros, and British pounds on hand, to be exchanged immediately at the lowest possible rates. If you are looking for any other type of currency – no problem! We can have it ordered and ready for pick-up the very next business day. Do I need identification to exchange foreign currency? If you are exchanging a sum of money below $3000, you do not need any identification for exchanging foreign currency. Above $3000, however, CashCity requires one piece of government-issued photo ID. What is the advantage of exchanging currency at CashCity? With CashCity, you can rest assured knowing that you are getting the most competitive rates based on real-time market prices. We have little doubt that our rates will best your bank’s by a wide margin, saving you a great deal of money. Our central Etobicoke location is easy to reach, and we are open for extended hours throughout the week to serve you better. Simply come into our convenient Etobicoke location, and we’ll exchange your currency quickly. If you are looking to get US/American dollars, Euros, or British pounds, we’ll exchange your money on the spot. If you require any other foreign currency, we will have it ordered and ready for pick up as soon as the next business day. As long as you are exchanging a sum less than $3000, no identification is required. For sums greater than $3000, please present one piece of government-issed photo ID.